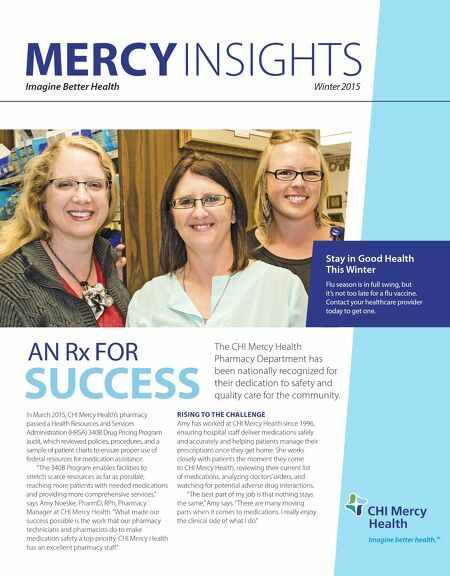 Imagine Better Health INSIGHTS MERCY Winter 2015 AN Rx FOR The CHI Mercy Health Pharmacy Department has been nationally recognized for their dedication to safety and quality care for the community. In March 2015, CHI Mercy Health's pharmacy passed a Health Resources and Services Administration (HRSA) 340B Drug Pricing Program audit, which reviewed policies, procedures, and a sample of patient charts to ensure proper use of federal resources for medication assistance. "The 340B Program enables facilities to stretch scarce resources as far as possible, reaching more patients with needed medications and providing more comprehensive services," says Amy Noeske, PharmD, RPh, Pharmacy Manager at CHI Mercy Health. "What made our success possible is the work that our pharmacy technicians and pharmacists do to make medication safety a top priority. CHI Mercy Health has an excellent pharmacy sta." RISING TO THE CHALLENGE Amy has worked at CHI Mercy Health since 1996, ensuring hospital sta deliver medications safely and accurately and helping patients manage their prescriptions once they get home. She works closely with patients the moment they come to CHI Mercy Health, reviewing their current list of medications, analyzing doctors' orders, and watching for potential adverse drug interactions. "The best part of my job is that nothing stays the same," Amy says. "There are many moving parts when it comes to medications. I really enjoy the clinical side of what I do." SUCCESS Stay in Good Health This Winter Flu season is in full swing, but it's not too late for a flu vaccine. Contact your healthcare provider today to get one.